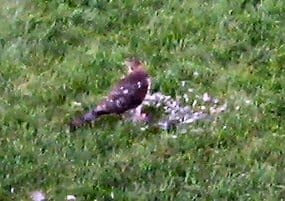 On Saturday morning we woke up to find a hawk in our backyard, finishing a morning meal of morning dove. I grabbed the camera and snapped one picture from upstairs. I ran down to the kitchen to take a closer shot, but it was gone in a flash. Collen and I went out to see if there was anything to clean up, but it had consumed the whole dove, leaving only piles of feathers scattered around the yard. The hawk is one of a pair that lives in the area. We watched one of them grab a rodent of some type off the hillside behind our house, and I spotted one perched on a house one time. Collen is a little big for them to go after, but if I had a little Yorkie or other tiny dog, I might think twice about letting it out unattended.